It is a two-storey townhouse within an urbanization. Living area of ​​100 m2: living room, kitchen, bathroom, bathroom and 3 bedrooms. Terrace on the floor with views of the garden and the pool. - Dining room: table, 2 sofas, rocking chair, fireplace, satellite channels, internet, board games. - Kitchen: hob, fridge, washing machine, microwave, oven, electric iron, paella, gas paellero, coffee maker, toaster, large variety of kitchenware and utensils. - Toilet and bathroom: shower and bathtub. Consumables included. With towels and bathroom supplies. - Bedrooms: two with double beds and another with three single beds. Each one with its wardrobe, sheets and blankets. Windows equipped with Climalit glass. Very well lit by natural light. Private garden with furniture and portable barbecue. Two-storey townhouse within an urbanization. Living area of ​​100 m2: living room, kitchen, bathroom, bathroom and 3 bedrooms. Terrace on the top floor with views of the garden and the pool. Patio with garden furniture. Solarium with views. Equipment. - Dining room: table, 2 sofas, rocking chair, fireplace, television, pay channels, internet-wifi, dvd, board games. - Kitchen: hob, fridge, washing machine, oven, microwave, coffee maker, toaster, paella, gas paellero, large variety of kitchenware and utensils. - Toilet and bathroom: shower tray and bathtub. With towels and bathroom supplies included. - Bedrooms: two with double beds and another with three single beds. Each one with its wardrobe, sheets and blankets. Fans Windows equipped with Climalit glass. Very well lit by natural light. Cot available (no additional cost) Community pool not very busy. Community garden. Private parking. Hemos pasado dos semanas fantásticas en agosto se nos han pasado volando, la casa tiene de todo y es muy cómoda, el patio lo puedes aprovechar durante todo el día y la zona exterior también esta muy limpia y bien cuidada, Melchor, el dueño, super amable nos ha ayudado mucho con sus indicaciones para llegar a las playas y a los paseos para la puesta de sol, de haber podido nos habríamos quedado dos semanas más. La casa se encuentra en plena sierra y esta todo muy nuevo y la atención de los dueños fue estupenda, fueron a esperarnos a las tantas de la noche para darnos las llaves. La casa está muy bien equipada, limpia y cómoda. 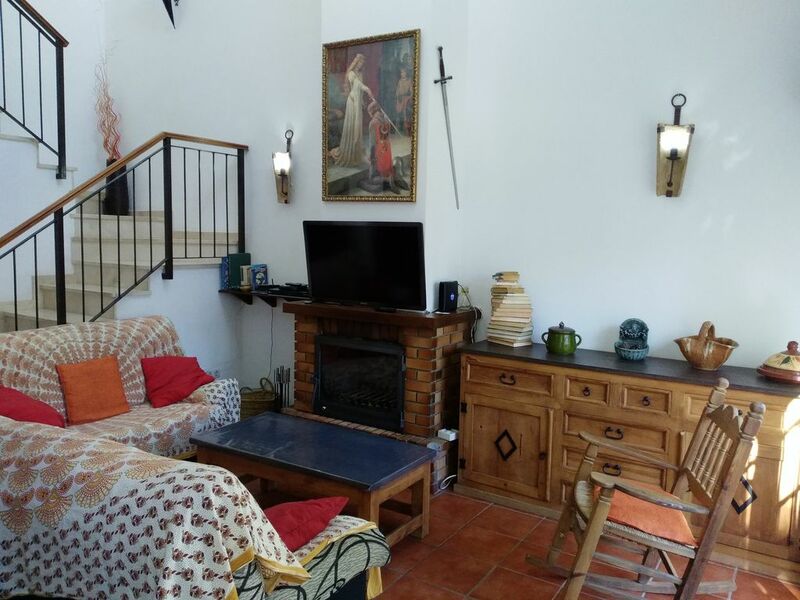 El salón con Chimenea genial y los sofás muy cómodos. El entorno es una maravilla, ideal para visitar Conil, Medina Sidonia y las lagunetas que se pueden hacer caminando con los niños. Los propietarios fueron muy amables y atentos durante toda la estancia. Muchas Gracias Melchor por vuestra hospitalidad y por hacernos sentir como en casa. REPETIREMOS SIN DUDA EN VERANO PARA DISFRUTAR TAMBIÉN DE LA PISCINA !!! Just along the banks of the Celemín River, there is a lane on the path known as the "Corredor Verde dos Bahías", a 93 km hiking route that runs from the municipality of Los Barrios to Puerto Real. If you want to leave for Puerto Real, you will cross the reservoir through the wooden bridge to follow the lane that leads to Benalup-Casas Viejas, enjoying the views of the marsh and fields. If instead you prefer to go in the direction of Los Barrios, you have to cross the mountains through its valley enjoying the views of the two mountain ranges that remain on each side until you reach the natural monument known as "La montera del torero" , as well as crossing streams and cork oak forests. On the stretch of the hiking path towards Benalup you can also make use of bicycle. Both the River Celemín and the reservoir can be used for barbel and black bass fishing. You can make use of the reservoir to navigate in boats other than motor. In the days when the east wind blows strongly, the practice of Kite Surfing in the waters of the reservoir becomes viable. • Bird and other species sightings. From the urbanization you can see the flight of vultures due to the proximity of the buitreras in the mountains. If we go into the path that crosses the mountain, you can see deer and roe deer. As a result of the absence of light pollution, on nights of new moon you can see a blanket of stars in the sky. And on the contrary, on full moon nights you can see the entire sierra bathed in the moonlight. Very suitable for night hiking since you hardly have to use a torch. Approximately, during the month of September you can hear the bellowing, the sound that emits the male deer in his mating season. They tend to get close enough to the plain and the hill in front of the urbanization, especially at night. Regardless of the use of the swimming pool of the urbanization, in one of the charcones of the river you can enjoy great baths in summer, in which the water is at a very pleasant temperature.